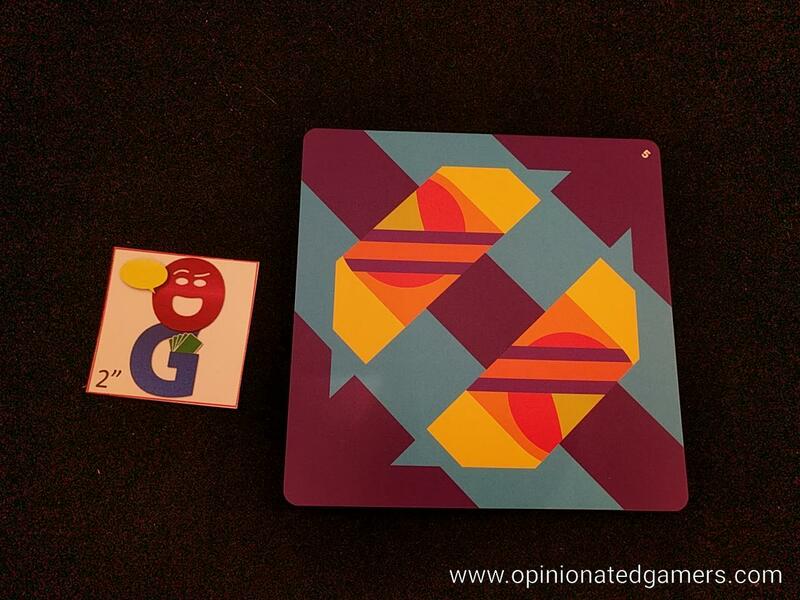 Layers is a classical speed game – by which I mean that there is a single type of puzzle in the game, and the player who is the fastest at solving that puzzle will win the round and likely the game. The puzzle itself is deceptively simple. Each player gets a matching set of 5 plastic cards. Each of these cards has some areas which are cutout, and there are two related though different coloring schemes on each side. 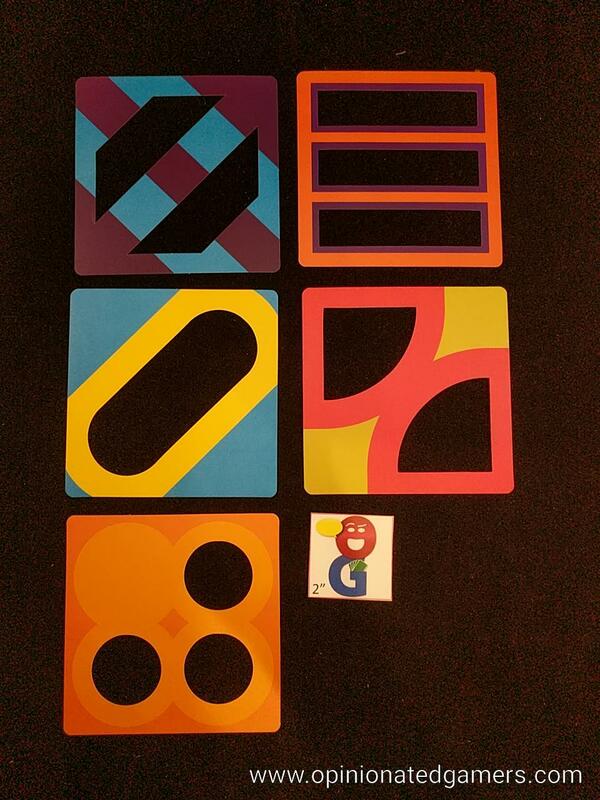 There are three sets of puzzle cards which use 3, 4 or 5 of those cards to make a colorful geometric pattern. Each of these decks is shuffled and placed face down on the table. At the start of each round, a scoring tile is flipped up – this tile will outline the scoring for the particular round. Generally, the “winner”, that is the first person to correctly finish the puzzle, will receive a number of points equal to the difficulty of the card (i.e. the number of layers needed to solve it). Points for second, third, and sometimes even fourth place are also shown on this tile. At the start of a round, all players have their five layers stacked together. The scoring cover cards are placed in a stack on the table with the #1 card on top. 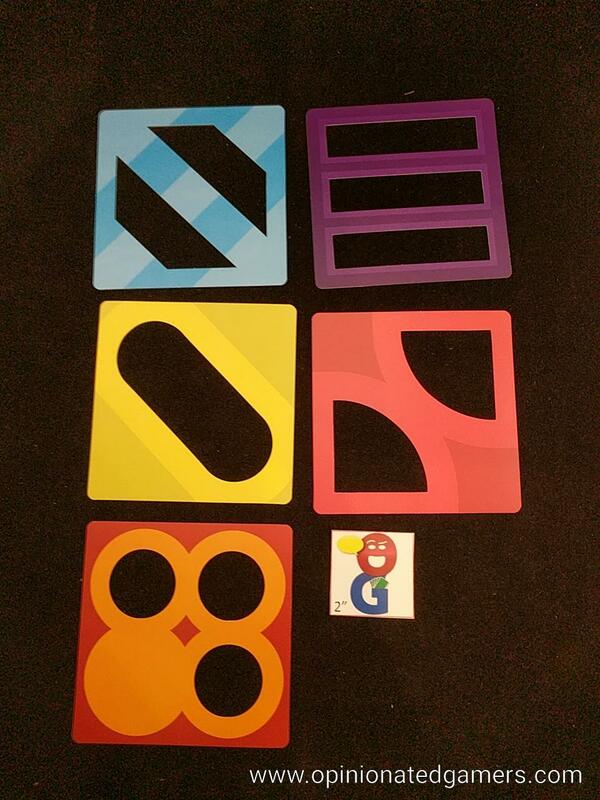 A start player flips over the top scoring tile and then chooses which stack he would like to play in this round. 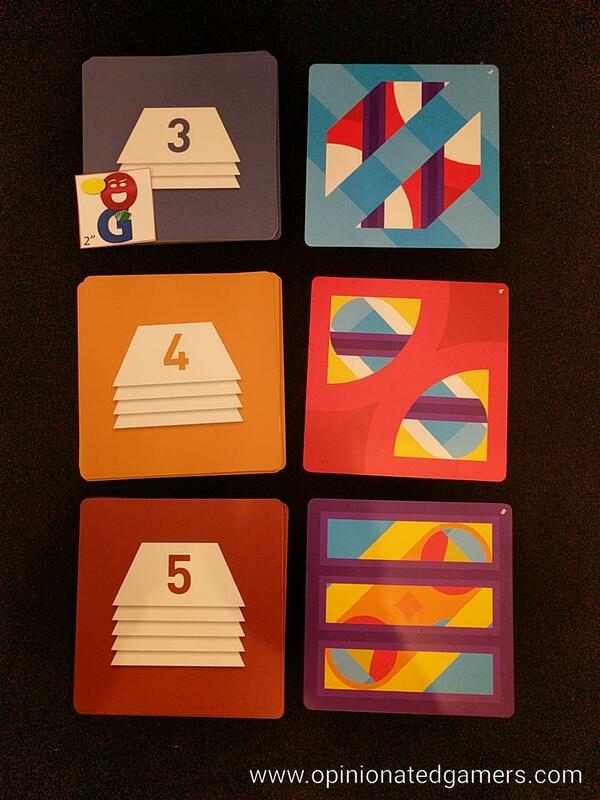 When all players are ready, the top card from the chosen stack is flipped over and all players look at the geometric pattern seen on the card. They then take their own layer cards and try to make the exact image seen on the puzzle card. Due to the different coloring schemes on each side of the layers as well as the unique cutouts, there is only one way to solve the puzzle. The first person to think that they have solved it will take the top (#1) scoring card from the stack and cover their own layers. They cannot mess with their layers any further. They also flip over the sand timer – all other players must finish their work before the sand runs out. As players feel they are complete, they take the next numbered card from the scoring stack and cover their own cards. The round continues until either the sand runs out or all players have taken a scoring card. Now, it’s time to evaluate the work. Starting with the #1 scoring card, reveal the stacked layer cards and see if it is an exact match to the puzzle card. If so, that player collects VPs equal to the highest shown on the scoring tile. If that first player was incorrect, the top prize remains available to the first person who correctly solves it. Then move to the #2 scoring card and again check. If correct, take the highest (leftmost) score reward that remains unclaimed. Continue this until all players have scored OR all the scores have been collected. Note, that it is impossible to score if you did not complete your work in time (and have your layers covered with a scoring card). The game continues for six rounds. The player with the most points is the winner. There is no tiebreaker. There is also a set of solo rules in the game. IN this timed blitz game, the solo player sets a timer for 3 minutes. He shuffles the three puzzles decks individually and sets them on the table. The timer is started and the player can choose to flip up a card from any of the three decks. He arranges his cards until he has solved it; then he chooses a new card from any of the stacks to continue play. He must stop when the timer runs out. The solo score is the sum of the numbers on the backs of all successfully solved cards. 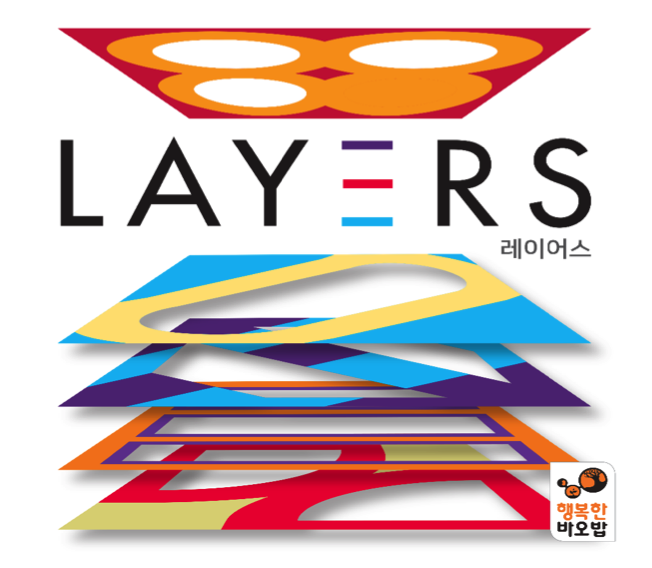 Layers is a frenetic speed game. As each round plays out, players are frantically arranging and re-arranging their cards to solve the puzzle. The puzzles (and also the five layer cards) are brightly colored and there are quite beautiful to look at. The easiest cards (three layers) are fairly simple to solve (at least for me), but the five layer puzzles can take a bit of time to solve. The key, at least for me, is to be able to look at the puzzle picture and be able to quickly visualize which order the cutouts are arranged in. I have found that this is turning out to be an innate skill – in that, gamers either have it or they don’t. And players that can’t quickly see this will struggle mightily at the game. 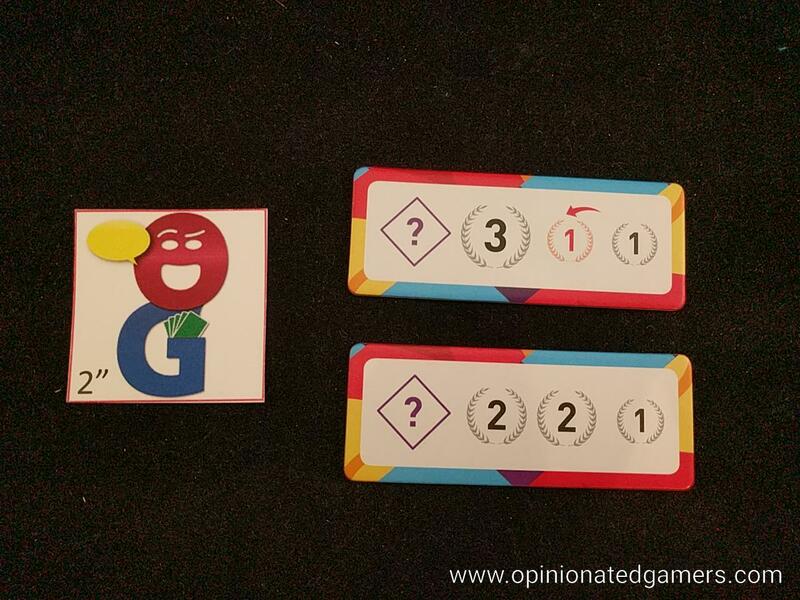 Like most speed games, there is no way to handicap the game easily, and if you are someone who doesn’t see the solution quickly, you essentially won’t compete in the game. That’s not to say that you won’t have fun – it’s still an enjoyable activity trying to get everything to line up correctly; but you’ll never compete for the win. The components are well made. 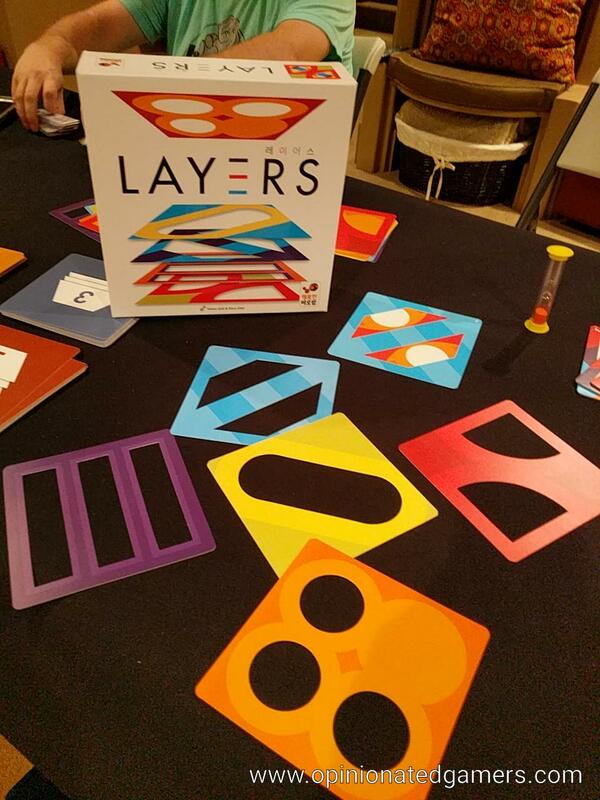 The player layers are a thin but sturdy plastic affair; they should be rip-resistant – which is good as you’re often shuffling them against each other quickly as you try to arrange them. Plenty of foresight was also put into the form factor of the vacuum tray. The components all nestle into their areas nicely in a way that looks pleasing and keeps everything safely tucked away. Dan Blum (3 plays): In general I agree with Dale’s take. It’s a perfectly fine speed puzzle game without enough variety to stick in a collection, unlike most of the Ubongo games, for example, which do have that variety. However, it’s fun while it lasts if you like this kind of game. I will say that I haven’t noticed the dominant player problem as much here as in similar games. Steph Hodge: Always enjoy a good puzzle game.